empowering, likely to alter traditional power structures – we were split on whether this is a core characteristic or an effect of social media. One of the challenges for students this semester (this week?) is to put all these concepts we discusses in a sentence and write a definition – or, find a definition of social media they agree with and and post it on their blogs. Set up your Twitter account and send me a tweet so I can put you on the CGT 581 Twitter list. Make sure your account has a photo and a bio, and a link to your blog. Set up your RSS feed reader (i.e. Google reader) and subscribe to Mashable, Read/Write/Web as well as a few blogs about enterprise 2.0 – see this list for a good start. You will also want to follow these Enterprise 2.0 people on Twitter. Set up your blog on wordpress.com or another platform of your choice. Write an About page and figure out how to write and publish a post. Send me a tweet with the URL of your blog. If you need help with any of the above steps, please look at this collection of resources. You can find here all the information you need to get started, including an explanation of blogs, permalinks, RSS feeds, step-by-step instructions for Google Reader, tips for your Twitter account, etc. For next class, you have to prepare a presentation about social media adoption. The information about this assignment is on Blackboard. Please take a look at the assignment instructions and grading form (click on Assignments to view them). 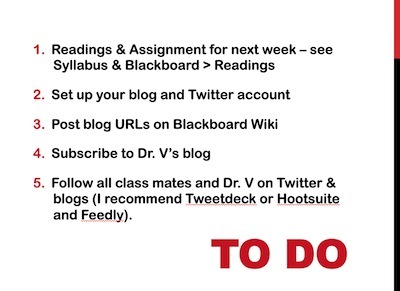 Also, please remember you have a lot of sources to get you started in the Readings folder on Blackboard. I believe these are all the reminders I promised you. Please let me know if you have any questions. You can email me, tweet, or post a comment below.